Wincanton People's Plan Questionnaire - Make Yours Count! Life is full of plans. The question is whether the plans are good or bad? Some of those plans end up on the desks of a special group of powerful people based in offices labelled "The Planning Department". These offices are to be found in your District Council Offices. These hard working folks have amazing authority over us all because they have the power and authority to "Approve/Disapprove" all planning applications. For some unknown reason this bunch of hard working individuals live a very precarious existence. They are loved by some (whose plans have been passed), and hated by many (whose plans have been rejected). It seems that to be a planner you need to be willing to be loved and hated by everyone! So why am I writing about planners in this way? Well I hope we all agree that good plans are vital to each community. If you have a plan it tells you where you aim to be. With good plans communities move forward in a sensible way. With bad plans, or indeed, no plans, communities stagnate. It's almost impossible to stand still. Wincanton is a small rural market town on the eastern edge of Somerset. It's one of those old historical towns that tend to get forgotten in the mists of time. I am always amazed when I attend meetings where you are asked to introduce yourself, and when you say you come from Wincanton you get replies like: "Is that in Dorset or Wiltshire"? Well, Wincanton is most definitely in Somerset, albeit by a thin thread. Travel east for only three miles and you have passed through Dorset into Wiltshire. But even Wincanton has a plan. We have "The Wincanton People's Plan". And this plan has been created by the "people of Wincanton", who were asked how they would like to see our town develop over the next 20 years (2006 - 2026). The people of Wincanton gathered together to look at suggestions and presentations and in the end a plan was completed that looked at most, if not all areas of life in Wincanton. However, we recognise that time has passed. We are five years further down the line, and like all plans, we need to revisit the original information to make sure that it is still relevant. After all, with the passage of time things change. That's life. So for all of you who live in and around Wincanton you will have received in the mail the latest survey document from The Wincanton People's Plan committee. This intrepid bunch of volunteers have spent many, many, many, many hours designing (I could have said planning) this questionnaire so that we can update the Peoples Plan to put before Town and District Councils, so that they are in no doubt what our people want. After those many hours they then spent many, many more hours chopping and changing it to make it even better before it was posted out to you for completion. When it was finally agreed the only missing ingredient was the paracetamol to cure the headache that comes with completing it. Sadly our funds didn't stretch to that. So there it is. You have received a questionnaire to complete and return to the Wincanton Town Council office at Market Place, Wincanton. The question is what you are going to do about it? We completed ours and I raced to the Town Council office to hand it in with pride, only to discover that they already have half a boxful from other enthusiastic folks in Wincanton. 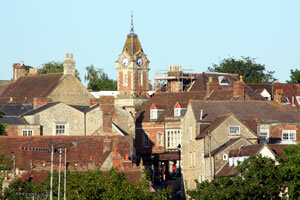 This is a great opportunity to have your say on a variety of topics important to Wincanton. I would encourage you all to complete this questionnaire and return it before the deadline of 5th December. If you care about the town you live in, let us have your views. All replies are taken seriously. It's a bit like elections. If you don't take part, what right have you to moan about what happens? No plan will please everybody, but the more people who reply the better the future plan will be. PS: We've paid the Post Office to distribute this questionnaire but at the time of writing, not everyone had received theirs. Please if you haven't had yours by the time you read this.